2 Level 8 monsters Gains 100 ATK and DEF for each monster in the GYs. Once per turn: You can detach 1 material from this card; until the end of your opponent’s next turn, this card cannot be destroyed by card effects, also neither player can Special Summon monsters from the GYs. For Rank 8 toolboxes, Sanaphond the Sky Prison is a good Extra Deck addition. Number 68 is a Rank 8 Dark Rock-type XYZ Monster with 2100 Atk and 2700 Def. It’s completely generic, only requiring 2 Level 8 monsters. It also gains 100 Atk points per monster in the graveyards. It has a lot of potential to get very strong, but high Atk isn’t really enough. At the cost of a material (and the gain of another 100 Atk points), Number 68 also becomes immune to destruction by card effects and shuts out both players from Special Summoning monsters from the grave. This can stop a few decks in their tracks, but not Paleozoics. So if you’re playing a deck that summons Rank 8, throw one Sanaphond into the Extra Deck in case you come against Lightsworns or something like that. We got two new Numbers in the Mega Tins, cause we couldn’t have all 4 of them in Battles of Legend for some reason. Number 41 and Number 89 would of been the better promo choices, but one is a prize card now and we don’t know when we will see the other. Even Number 29 could of been cool. I feel we got the worst of the two Numbers from the OCG Collectors Pack in our tins and we review one of them today, Number 68: Sanaphond the Sky Prison. Sanaphond is a Rank 8 that requires two Level 8 monsters, easy in a Rank 8 deck. Sanaphond also gains 100 ATK and DEF for each monster in the GYs, so he can be very strong later in the game. Once per turn, you can detach an XYZ material from this card to prevent this card from being destroyed by card effects and prevent special summoning from the GYs until the end of your opponents next turn. Graveyard reviving is powerful, so shutting that down can be detrimental, also the protection from destruction effects is nice, but there are Kaijus for that. I said this was one of the worse Number Monsters from the Collectors Pack, but this one is still pretty good. There are better Rank 8s, but you can play him if you have room. 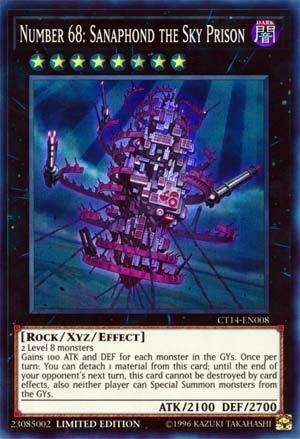 Todays card of the day is Number 68: Sanaphond the Sky Prison, a rank 8 dark rock Xyz with 2100 attack and 2700 defence. Sanaphond needs any two level 8 monsters as material. Now Sanaphond has a pair of effects, but are more closely related to the card’s name in the OCG. Firstly, Sanaphond gains 100 attack and defence for each monster in either players grave. It’s more of a defencive wall than something to go aggressive with. By detaching a material, Sanaphond’s second effect prevents itself from being destroyed and preventing any monster from being special summoned from the grave until the end of your opponent’s next turn. It’s a good generic protection effect, but on a rank 8 monster, it may not be that useful. Sanadphond hasn’t found its niche use yet and is just waiting for players to make full use of its effects. Number 68: Sanaphond Sky Prison is our midweek card. Dark ,Rank 8 (generic two Level 8 Monster XYZ requirement) Rock (supported well but often overlooked) and 2100 attack (low) with 2700 defense. So first off, you gain 100 attack and defense for each Monster in either Graveyard. That’s minimal, but should make this guy contend a little better. 3000 attack or higher shouldn’t be too hard to achieve, and late game, this guy could be huge. But he’s likely coming out mid game I figure. The higher the attack, the better, as this card can (once per turn) detach an XYZ material to prevent it from being destroyed by card effects, meaning your opponent will HAVE to attack it to rid the Field of its presence. Said effect is in place until the end of your opponent’s next turn. Both players are also unable to Special Summon from their Graveyards while said effect is activated. I like this card too, and while I do find it a bit situational, it can easily work in your favor. I don’t see him winning games on his own, but the right cards can make this easier for you. He’s fairly splashable, and generic enough too.